ITAHARI, March 24: Interest in banana farming has grown amongst farmers in Sunsari district. Ram Kumar Mehta, a local of Rajdhuni, used to cultivate paddy until six years ago, producing 2,800 kilograms of rice every season. After having been informed by agriculture experts that banana farming provided a more profitable market, he decided to change course. "I save Rs 200,000 annually after all expenditure through banana farming," Mehta said, adding, "Previously, while growing paddy, I had difficulty covering my daily household expenses." In Dakshinavarti, Sunsari, along with growing paddy, farmers have begun banana farming by abandoning other crops. Sadananda Yadav, a local of Babiya, began banana farming after being dissatisfied with sugarcane farming. He says that in absence of pest infestation and heavy winds, banana farming can prove extremely profitable. 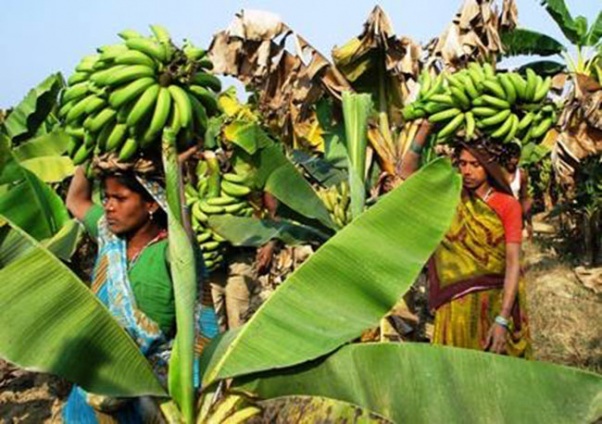 In recent years, many farmers have shifted from paddy, wheat, and sugarcane to banana farming. Growing wheat and paddy involves more hard work while farmers do not receive suitable and timely wages in sugarcane farming. According to Bauwa Lal Choudhary, Chief of Krishi Gyan Kendra sunsari, banana is comparatively easier to grow. Banana farming is two times more profitable than sugarcane farming, he said. In general, banana plants bear fruits for nine to twelve months, three months after which the fruits can be plucked off. During this time, it is important to focus on irrigation and pest control. However, if banana fruits are not immediately taken to the market after turning ripe, they go wasted. Thus, oftentimes, the fruits have to be sold at cheap price. Farmers complain that they do not get a reasonable price for their produce as brokers come to the farms itself to buy the fruit. Approximately 300 hectares of land have been used for banana farming in Sunsari, with an annual yield of 6,400 metric tons. In local markets, banana is sold for Rs 50 to Rs 70 per kilogram.